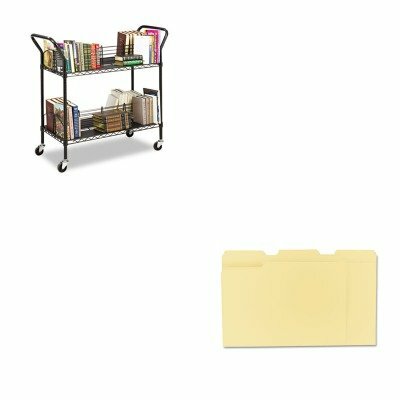 lt;stronggt;SAF5333BLlt;/stronggt;lt;BR/gt;Safco Wire Book Cartlt;BR/gt;Double-sided with slanted shelves makes transporting all your books and reference materials perfect. See all the beauty of your books with the attractive, durable all steel post construction and welded wire shelves. Shelf adjusts to accommodate large materials. Rolls easily on four swivel casters two locking. Color: Black Capacity Weight: 200 lbs. Caster/Glide/Wheel: Four 3amp;quot; Swivel Casters.lt;BR/gt;lt;BR/gt;lt;stronggt;UNV12113lt;/stronggt;lt;BR/gt;Safco Wire Book Cartlt;BR/gt;Classic folder constructed to resist tearing. Bottom triple-scored for no-sag expansion. Undercut at tabs for increased indexing area. 11 pt. Manila stock. File Folder Type: Top Tab Size: Letter Folder Material: 11 pt. Manila Colors: Manila.